Are you ready for the new season of Better Call Saul? AMC just announced the TV show’s fourth season and the new series Lodge 49 will debut this summer. Meanwhile, Lodge 49 “is a light-hearted, endearing modern fable set in Long Beach, California about a disarmingly optimistic local ex-surfer, Dud, who’s drifting after the death of his father and collapse of the family business.” The cast includes Wyatt Russell and Brent Jennings. 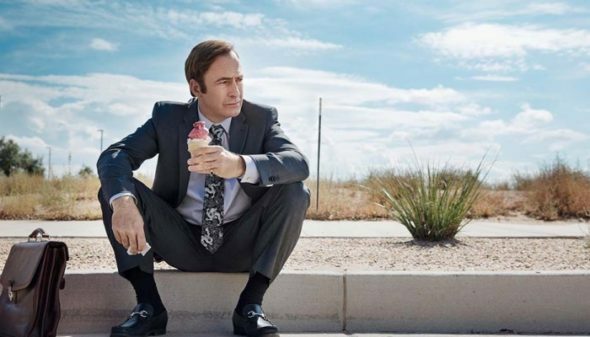 Season four of Better Call Saul premieres on AMC on August 6th at 9 p.m. ET/PT, followed by the series debut of Lodge 49 at 10 p.m. ET/PT. What do you think? Do you watch Better Call Saul? Will you check out Lodge 49? More about: AMC TV shows: canceled or renewed?, Better Call Saul, Better Call Saul: canceled or renewed?, Lodge 49, Lodge 49: canceled or renewed?